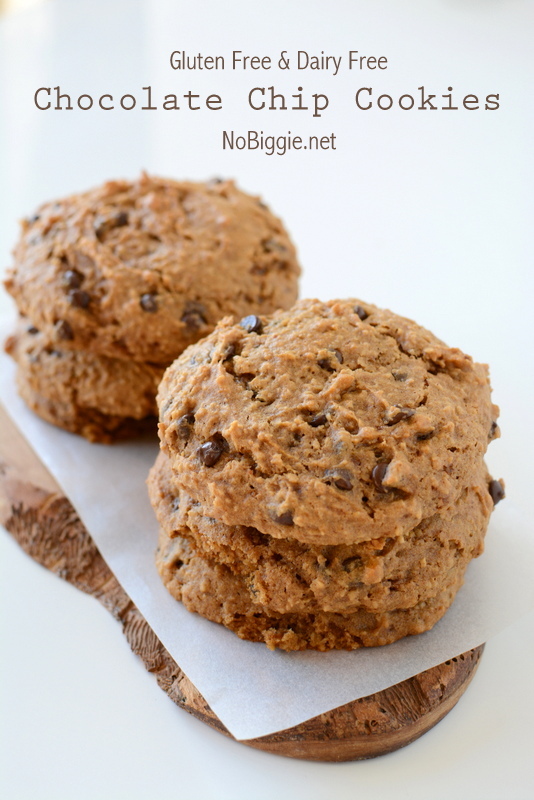 Gluten Free and Dairy Free Oatmeal Chocolate Chip Cookie recipe | NoBiggie.net – these are soft and chewy! 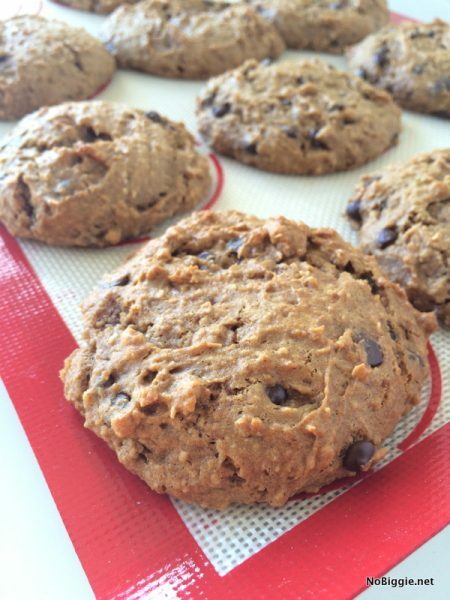 We are still on an elimination diet to find out if we have food sensitivities, and during this time, I’ve been on a quest to find a good chocolate chip cookie recipe…and it’s hard! If you take away the magic of butter and regular flour and things that just make a chocolate chip cookie what we all know and love, it’s hard to find a good substitute to a classic. After a few trial and error recipes, I think I found one we all like! The crazy thing is that it looks like it might have pumpkin in it, but it doesn’t. It also has the texture of a pumpkin chocolate chip cookie, but it’s not. 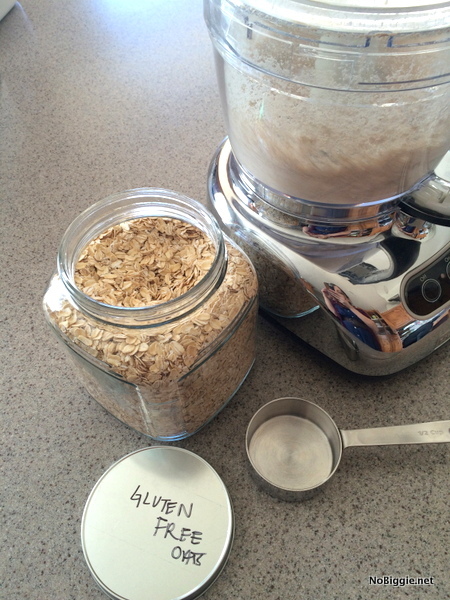 It’s just regular oatmeal chocolate chip…but gluten free and dairy free. Before I share the recipe, here’s a fun look at my first few flops. These little cookies were super dense, almost like a biscuit or a scone. The thing about most gluten free cookies that I’ve tried to make is that what ever the dough looks like when it goes into the oven, the cookie will look the exact same after you take it out of the oven. Here’s another flop. 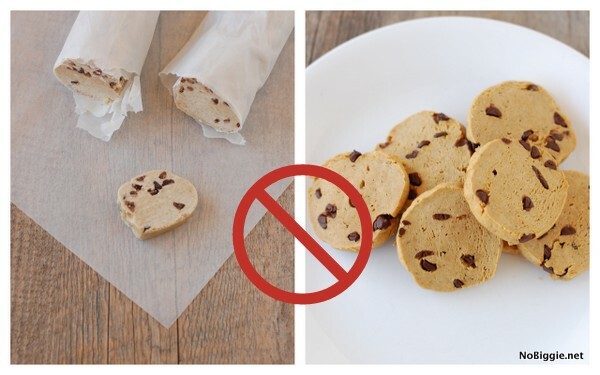 To get a better cookie shape, I tried slicing the cookies out of a big cookie roll, and they looked exactly the same after baked…little hokey pucks! And finally the cookies that I’m sharing today. 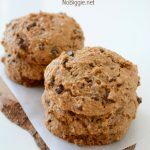 They might not look exactly like you’d picture a chocolate chip cookie, but they are soft and delicious…and I’m glad to have finally found a recipe we like. 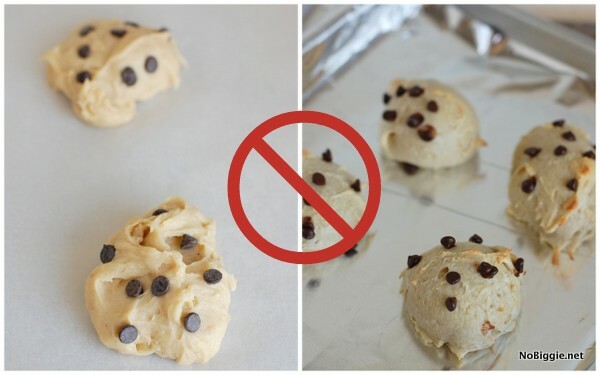 One of the big things I noticed about this recipe that makes it different than the rest is that you can see that the cookie actually changes shape in the oven…like a cookie should! Okay, here’s the ingredients out all together. 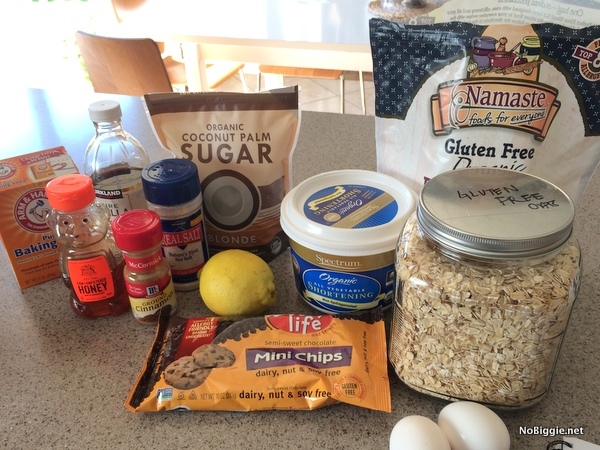 A few things like lemon juice and cinnamon are not in your usual cookie lineup, but they add a lot to the flavor. I’ll share the full recipe below, but to start, use your food processor to grind the gluten free oats into a fine or semi-fine flour. Preheat oven to 350 degrees. Mix all wet ingredients together: palm shortening, coconut palm sugar, honey, lemon juice, vanilla, and eggs, adding the eggs in at the end one at a time. Mix well in your mixer. In a different bowl combine all the dry ingredients together with a whisk: GF flour, fine ground GF oats, baking soda, cinnamon and sea salt. Stop your mixer and dump in all the dry ingredients. Mix well, but don't over mix. Add in the mini chocolate chips and run your mixer on low a few times to mix them into the cookie dough. 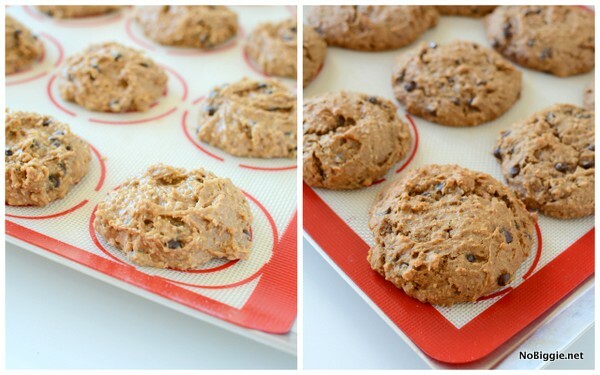 Using a uniform ice cream scooper, place cookie dough scoops onto a parchment lined or silpat lined cookie sheet pan. Bake for 10 - 13 minutes until the cookies start to look golden brown. Pull out of the oven and cover with a clean hand towel and let the cookies continue to sit on the hot pan for another 10 minutes or so. This recipe makes 12 to 14 cookies (depending on size). We love them! You’ll have to give them a try!